2018 World Cup Russia is arriving. If you have the enough time and energy to watch the live matches of 2018 World Cup, that's fantastic, cuz you have chance to record the 2018 World Cup videos with your HD camera. And you can also upload the recorded 2018 World Cup matches video to YouTube, etc. video sharing sites to share with the broad masses of football fans. Well, question is coming: how to upload the recorded 2018 World Cup video to YouTube, since your HD camera recorded video is formatted with MKV AVCHD MOD MTS, etc. HD video formats, which are not compatible with YouTube friendly formats. 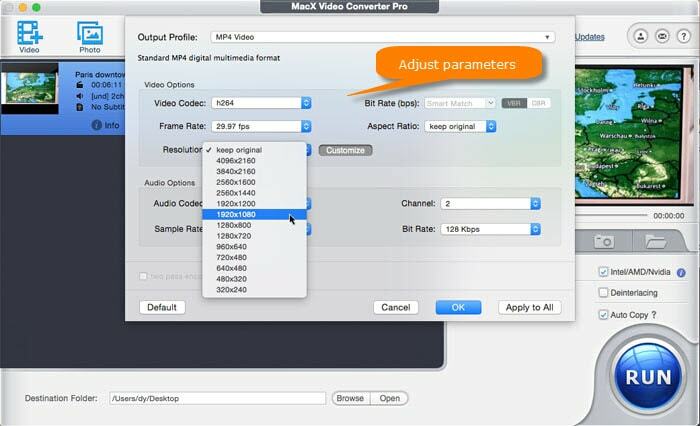 MacX Video Converter Pro, the specialized video processing tool for World Cup fans. It helps convert 4K 1080p 720p HD camcorder 2018 World Cup videos to YouTube supported video formats like converting mod videos from JVC HD camcorder to MP4, mts videos from Sony HD camcorder to FLV and Panasonic and Canon HD camcorder included. Meantime, it can serve as a video editor and compressor for World Cup, allowing you to adjust video audio bit rate, sample rate, aspect ratio, reduce file size, add watermark/subtitles and more. With the multi-core CPU & Intel QSV hardware acceleration tech aids, the world's No.1 fast speed will improve your video conversion experience to the new heights. Before you upload World Cup video to YouTube, you'd better know the best upload encoding settings for YouTube. Video: MP4, H.264, 24, 25, 30, 48, 50, or 60 fps. Video bit rate depends on the video resolution. Interlaced video should be deinterlaced before posting. Audio: AAC-LC, Stereo/Stereo + 5.1, 90khz or 48khz. If your 2018 FIFA World Cup videos that you want to transfer to YouTube are not in the right formats and parameters. Use steps below to adjust the source videos. Step 1: Click the Add Video button and select the video to load. After the video is loaded, an output format window appears. Step 2: Scroll down the Output Profile Category and find YouTube Video. Select MP4 and click OK to make it applied. Step 1: After you load videos and select output format, Click the Setting icon to get options to adjust video and audio settings. Step 2: Select frame rate, video resolution, bit rate, aspect ratio, audio sample rate and bit rate for YouTube. Click OK to make the settings valid. Step 1: Click the Edit icon to open the video editing screen. Step 2: You can trim out unwanted part, crop videos to remove area, and add subtitles to your video. Free World Cup video editors like MacXVideo are also good option to go with to add video effects and make stunning World Cup videos easily. The max file size you can upload to YouTube is 128GB, which is not enough for 4K UHD World Cup videos upload. The feature-rich video processing tool is also able to reduce large file size for YouTube by up to 98% with good quality reserved. It lets users cut down videos by transcoding video codec formats, trimming, splitting long videos, cropping, and adjusting video specs like bit rate. After you've all set, click the RUN at the bottom to start World Cup video processing for posting to YouTube. Tips: you are able to use the program to download FIFA World Cup 2018 videos, theme songs and anthems, highlights and full matches from YouTube, Vimeo, Facebook, ESPN, 300+ free World Cup video streaming sites. To do this, click the YouTube icon at the top, copy and paste video URL to the link box, click Analyze. Then select video format, resolution and size you want to download, and click Download Now button to begin downloading World Cup clips. Once you prepare World Cup videos with the recommended encoding settings, it's very easily to post them to YouTube. Step 1: Open YouTube homepage and sign in to YouTube. Step 2: Click the Upload button at the top of the page and the upload window shows up. Step 3: Adjust the privacy settings. Then click the grey upload icon, and select your world cup video file to upload. Or directly drag and drop your video files. Step 4: The video will share to YouTube. You can adjust basic info etc. Finally, click Publish button and the World Cup video will be published on YouTube. Note that it may take a long time to complete the uploading process. The time it takes depend on your World Cup video files size, internet connection speed, and the number of users who are publishing videos. MacX YouTube Downloader helps free download Russia FIFA World Cup 2018 videos, full matches, highlights, and official songs from YouTube, Facebook, Dailymotion, Myspace, Vimeo, etc. 300+ sites for offline playback on iPhone, iPad, Android, HD TVs etc. Save World Cup videos, song videos from YouTube on Mac. 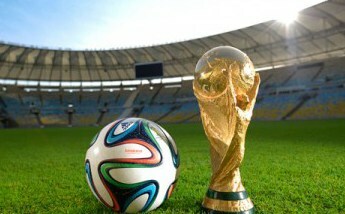 Fast download 4K UHD World Cup video from YouTube for free. How to convert YouTube video of FLV, MKV, AVI etc. to MP4. 4K UHD video editor for FIFA World Cup.